ALBANY – John J. 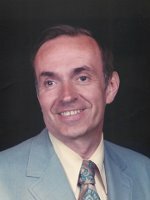 (Jack) Delaney, 86, of Glenmont, formerly of Clifton Park, passed away peacefully in the company of his family Monday August 27, 2012, at Albany Medical Center. Jack was born in Troy, the son of the late Joseph P. and Florence Murphy Delaney. He graduated from LaSalle Institute and attended Rensselaer Polytechnic Institute where he received a BS in Management Engineering. He was employed by Albany International Corp., and during that time he lived in Cowansville, Quebec and Gosford, New South Wales, Australia before returning to live in Clifton Park. He was also a member of Rotary International and the Lions Club. An avid sportsman in his younger years, he later enjoyed following his children’s and grandchildren’s exploits in their sports endeavors. Jack will be remembered for his love and support of family and his resilience and dignity in the face of adversity. Jack was predeceased by his wife Shirley Nugent Delaney in 2004. He is survived by his children Ann Delaney of Rochester, Maureen McKellar (Bill) of New South Wales, Australia, Jeanne Paratore (Joseph) of Glenmont, Susan Delaney (Michael Fields) of Guilderland, and John P. Delaney (Karen) of San Ramon, CA; his sister Joan Arcand (Arthur) of Rancho Palos Verdes, CA; and by his nine grandchildren – Shawna, Barbara, John, David, Ryan, Joseph, Megan, Austin and Kaelin. Funeral services will be held in the Hans Funeral Home, 1088 Western Ave., Albany, Saturday morning at 8:30, and from there to Our Lady of Victory Church, 55 North Lake Ave., Troy, at 9:30. Relatives and friends are invited, and may call at the funeral home Friday from 4-7 p.m. Entombment will be in St. Mary’s Cemetery, Troy. In lieu of flowers, memorial contributions may be made to the American Heart Association https://donate.americanheart.org. To leave a message of condolence for the family, send a sympathy card, or obtain directions to the funeral home, please visit www.HansFuneralHome.com. I am so happy that I got to see and talk to your recently. all of the Nugent girls loved Jack. thoughts and prayers to all of you. Sue and family, I am very sorry to hear of the passing of your dad. My sympathy and prayers are with you in this time of grief and loss. Sue, it was with great sadness that I learned your Dad had passed. Please know my thoughts and prayers are with you and your family in this time of loss. Our deepest condolences regarding the passing of your father. We hope that his eternal spirit , memories, and love remain in your hearts and minds to help ease this painful time. Thinking of you. Very sorry for your loss. Uncle Jack is such a great guy. My condolences are with the Delany family. Dear Sue, I am so very sorry to hear about the loss of your father. My thoughts and prayers got out to you and your family. We are so sorry in the loss of your Dad. It was great to see him a few weeks ago at my mother’s funeral. I had the pleasure of going to Quebec as a young man to visit your Mom & Dad many years ago. So sorry to hear about the loss of your Dad. I have many fond memories of your family in Cowansville. You are all in my thoughts and prayers.